The novel opens in a British research institute, where the linguist Chris Sole teaches a rare form of language to four children living in an artificial environment. The language is English, but grammatically restructured by a computer: an English "autoembedded" that no person regularly socialized can speak. The aim of the experiment is to discover if the grammar is inherent in the human brain, or if you can train individuals to think in more complex grammars, which would open new possibilities for the mind. Meanwhile, in Brazil, a friend of Chris Sole is studying an Indian tribe known as xemahoa. A flood threatens the territory of the xemahoa because of a large dam built by the Brazilian military government with the financial and technical assistance from the United States. Anthropologist Pierre Darriand is proud to have discovered that xemahoa speak two kinds of language: everyday language and a second language, rhapsodic, employed under the influence of a drug. This "xemahoa B" is a language "autoembedded" with a seemingly incomprehensible syntax, very similar to the artificial language Sole teaches the four children in England. A third element appears in the story. An alien spaceship arrives, and Chris Sole is sent to the United States to try to communicate with the occupants of the ship. The aliens call themselves sp'thra and learn English very quickly. Sole discovers that languages ​​are its main concern: they want to exchange technology for live human brains, "programmed" to speak different languages ​​on Earth and grow greatly excited by the discoveries of Pierre Darriand in the Amazon basin and ask for some live xemahoa brains. 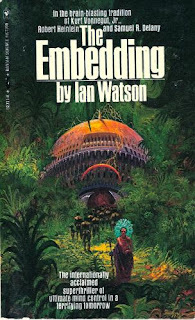 "Ian Watson speculates in his most famous and award-winning novel about language. No, on the perception of language. No, not only that, on learning and intelligence, and perception of the dimensions in the language. And on imperialism and its consequences. And on a first contact with aliens. And on the role of science and ethics. And also on a strange rite of passage, on drugs, on terrorism, almost a revolution, in a country taken over by the military. 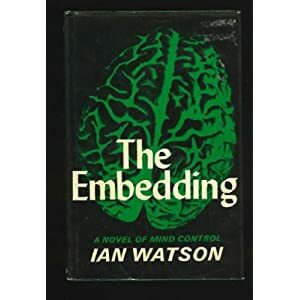 ... by making narrative zapping, it manages to resolve all those issues in only 200 pages..."Embedded" is also difficult to read. Not that is badly written, just the opposite, but their characters are so unsympathetic, and even a good stretch of the narrative you don't know exactly what they do or what they want. the main theme of the novel is that our learning and reasoning are affected by the structure of language and the amount of space junk or surplus that exists between the information and it's therefore essential to create a language without these spaces, a language "embedded " so we could get a satisfactory understanding of many concepts which now escape us. This theme is no doubt fascinating and unusual, like many other critical issues with background fields in this story. The problem is that Watson doesn't make it easy to imagine what he does not explain."